You Have Eevolved Into Leafeon! Are you a peacemaker? The strong and silent pacifist, with power and a good sense of when to use it? Then you are a Leafeon! This healthy eeveelution is one of wisdom. It’s not a coward – it won’t back down in times of need. By getting Leafeon, you show that you know when to fight and when to steer clear. You are strong, but often have better (and perhaps mysterious) things to do. You care deeply for your friends, family, and values, and you appreciate what you have been given in life. Leafeon is an eeveelution that strikes awe with its rare and one-of-a-kind appearance; it’s not every day that one sees a foxy Pokemon with vegetation in place of its ears and tail. Leafeon is also one of the least-commonly chosen evolutions of Eevee. Leafeon was first introduced in Pokemon Generation IV. It is a grass-type Pokemon that can eevolve from Eevee at any given level. To do so, a trainer just needs to level up their normal little friend in the vicinity of a special rock covered by moss on Route 20 in Kalos, the Pinwheel Forest in Unova, Eterna Forest in Sinnoh, or the Petalburg Woods in Hoenn (in Pokemon Omega Ruby and Alpha Sapphire). In the Pokemon TV show, Leafeon made its debut appearance as owned by Zoey in Double-Time Battle Training!. Its follow-up spotlight was against trainer Nando’s Kricketune and Lopunny in the episode Sinnoh Grand Festival. Since then, Leafeon has made several other major appearances with the other Eevee evolutions. It appeared with the whole squad in both Eevee and Friends and Team Eevee and the Pokémon Rescue Squad! – two classics. Leafeon also had a small and subtle cameo in the episode Giratina and the Sky Warrior, alongside other eeveelutions. Again, Leafeon is not as popular as its counterparts (probably due to it being from the newer generation IV). Another reason, though, may be the Pokémon’s temperament and special abilities. Simply put, Leafeon is a pacifist. While other Pokemon are always ready and looking for a fight, this Pokemon would rather sleep under patches of sunshine in an effort to purify the air and maintain its holistic environment. Leafeon cares deeply for nature, and trainers who obtain one often share in this passion. Life is not about battle for these individuals – instead, it is about appreciating the dirt, the trees, and everything in-between. Leafeon a quadruped mammalian creature. It looks somewhere in the middle of a cat and an agile fox: both canine and feline. It boasts a slim tan body accented by furry dark brown paws. 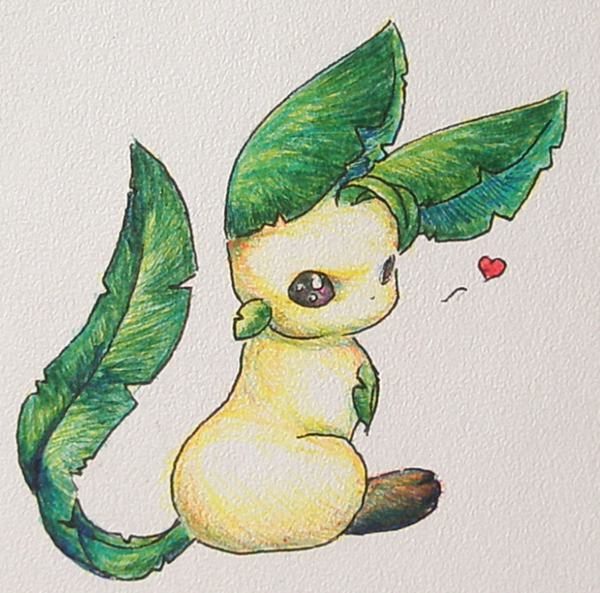 Leafeon’s most defining feature is what makes it unique: in place of ears and a tail, the Pokemon has flourishing vegetation that look like giant leaves. Its tail looks like a clipping from a banana tree, and its ears are teardrop-shaped. Additionally, there are sprouts and buds scattered throughout the length of its body. Leafeon is said to have a plant-like cellular structure, which explains its vegetation. This fox is actually a shrub! Because it is not actually a mammal, Leafeon can perform and feed via photosynthesis. The next time you see one sleeping under the sun, remember – the Pokemon is both cleaning the air and having its dinner. For trainers looking for a companion who is pure at heart, and whose strength is not so upfront, Leafeon is a wonderful eeveelution choice!